It's easy to think that with all the technology that is available today, kids will have a very different experience growing up. This is true. However, there is a view that kids spend all their time in-doors playing on their XBox, missing out on the simple pleasures that exploring their surroundings can bring. Yesterday I decided to go for a walk around the village that I grew up in. 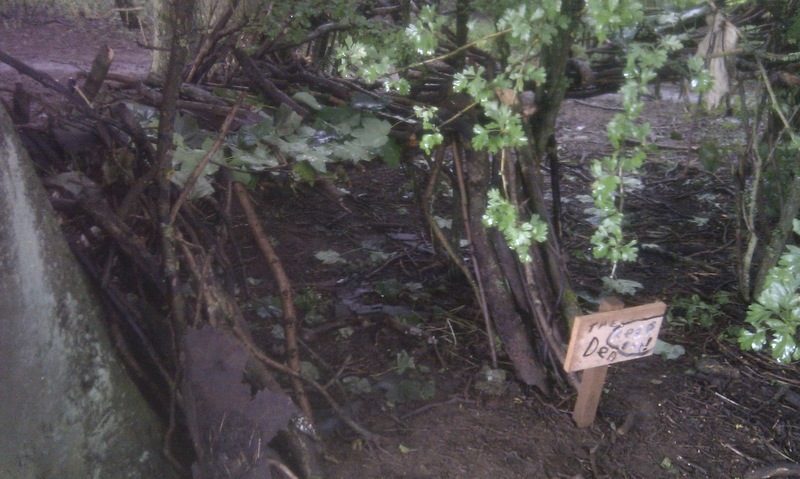 Curiosity lead me to explore some of the places where we had made dens when we were younger. Me and my friends would spend every minute of the summer holidays building dens, getting covered in mud in the process - and we loved it. We didn't have just one den but a whole group of dens, joined by the imagination that makes your dreams seem so real when you are young, we called it the "den chain". A den I found whilst exploring. As I was walking through a wood near to my old home I stumbled across this (pictured). It was refreshing to find that children today still lust for the same satisfaction of building something within nature. This quite impressive structure reminded me of how we would sit in our dens for hours on end waiting for an imaginary 'enemy' to come and fight us for our territory. Of course no enemy ever came, but the strength of our imaginations was never dented. As children, our imaginations ran wild with all that surrounded us. Dreaming up elaborate stories of heroes and villains, angels and demons, mystical beings that were never before known to man. As we grow older we lose the ability to let our imaginations guide us. We become guided by what we think we know for certain. No enemy is ever coming, sitting in a den for hours expecting one would be seen as a sign of madness. I believe that we need to rediscover our younger imaginations and give them greater freedom to guide us along our path. Let them inspire our work and influence our decisions. With innocence and naivete we can obtain a fresh perspective of something, allowing us to see what so many before us have missed.